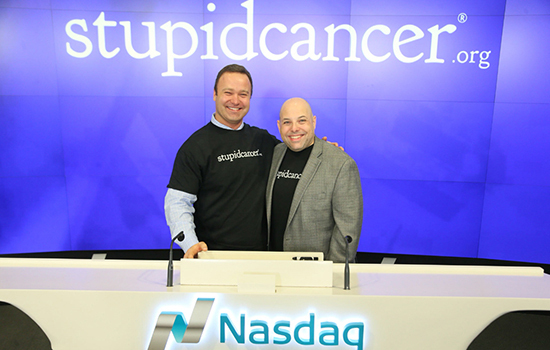 David Fuehrer ’02, ’03, left, and Matthew Zachary, CEO of Stupid Cancer, rang the opening bell at Nasdaq the day before Thanksgiving. David Fuehrer’s life was put on pause at age 25 when he was diagnosed with testicular cancer in 2002. That new life shattered at age 30 during a routine visit when he was diagnosed with a different form of invasive testicular cancer—leading him to debilitating radiation and life-long hormone therapy. He subsequently moved back to Rochester and founded Emerging Space, a company that helped people turn their ideas into successful products and services. Not surprisingly, his primary client became Matthew Zachary, CEO of Stupid Cancer, the largest U.S.-based charity that supports young adult cancer patients and survivors where Fuehrer also serves on the board. Fuehrer ’02, ’03 (professional and technical communication, MBA) is proud that five generations of his family have attended RIT dating back to 1904. One of his greatest joys last year as an adjunct professor at Saunders College of Business was to teach students to be true to themselves. And now he is following his own advice. Fuehrer spends his work week in Manhattan with Zachary at Stupid Cancer, where they launched SC Research Ventures (SCRV) in July. “It’s the first healthcare company that focuses on identifying and addressing the unmet needs of the tens of millions of people who will survive cancer,” he explained.